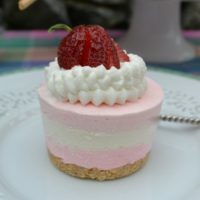 No Bake Mini Cheesecakes are so cute and easy to make. Layers of shades of pink cheesecake filling on top of a chocolate cookie crust makes this dessert perfect for entertaining. Graduations, Wedding and Baby Showers and Christmas are just a few holidays to celebrate with these cute little cheesecakes. Triple layers of pink and white cheese cake filling are packed in a graham cracker crust lined jumbo sized silicone muffin pan and frozen until set. This no bake dessert is garnished with piped whipped cream, berries, or Easter Eggs ( Almond M & M’s.) Or a cute ramen noodle egg nest. For Easter Nest: tip # 1 M or Sultan Tube, Green Sprinkles, Almond Easter M & M’s or other candies and tips. For Spring- tip 1 M or Sultan tube, fresh berries with mint sprigs. Slice strawberries vertically leaving stem in tack for an easy garnish. 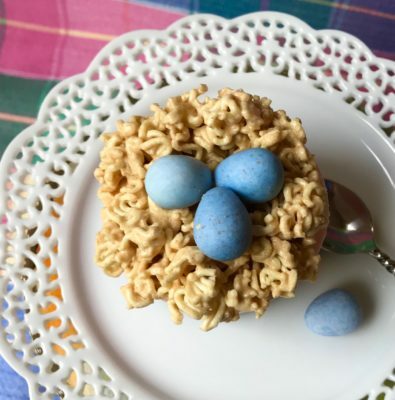 Ramen Noodle Nest: 1 package Ramen noodles without spice packet, 1/4 cup butter, 4 tablespoons peanut butter and marshmallow creme, 1 teaspoon vanilla or flavoring of choice. ( you can also add 1/4 cup melted mini chocolate chips ). Garnish with Cadbury Eggs. Process cookies or graham crackers in food processor, place in small bowl. Melt butter in microwave for 15 seconds. Add to crumbs, stir to blend. Press 1-2 tablespoons of crumbs in bottom of each silicone muffin mold. Set aside. In large mixing bowl with paddle beater, add cream cheese and beat until smooth. Scrape down sides, continue beating to blend. Add granulated sugar, lemon or lime juice, salt, and heavy cream. Beat until smooth. In small cup fill with 2 tablespoons cold water and one package gelatin, stir to blend. Place in microwave for 10 seconds to completely melt. Add cooled and liquid gelatin to cream cheese mixture. Beat to blend. Divide the cheesecake mixture into three bowls and add food gel color, one to each bowl. Stir with spoon to blend color. Using a small cookie scoop or a piping bag with no tip, fill muffin cup with dark pink filling, smooth with a spoon to cover cookie crust. Make sure to take a wet paper towel and wipe the sides of the mold to remove excess filling above the layer. Repeat process, with white or vanilla cheesecake next, then top with soft pink layer. Smooth top of mold so the filling is flat, use an off set spatula for this process. Place in freezer and freeze at least 3 hours or over night. To serve, remove frozen cheesecake out of mold and allow to sit 20-30 minutes. Garnish with piped whipped cream and berries-decorations. Whipped Cream Instructions: In chilled mixing bowl add heavy whipping cream and beat on low with a wire whisk attachment. Gradually add confectioner’s sugar and vanilla. Beat until stiff peaks form. Place in piping bag an pipe a nest or other preferred dollop. Garnish as desired with candies or fresh berries and mint sprig. In microwave melt together butter, marshmallow creme, peanut butter and vanilla. Mix until smooth, then add crumbled raw ramen noodles. Stir to blend. Drop by spoonfuls onto wax paper add Cadbury Eggs and refrigerate until set. If you add chocolate chips, mix the chips with marshmallow creme to melt. Can substitute cookie crumbs for graham crackers, if using grahams, add 1- 1/2 tablespoons granulated sugar. When using Oreo cookies, no need to add sugar. Oreo thin cookies have very little filling which is preferred for this recipe. A Sultan Pastry Tip is a Russian tip that pipes a round icing ring with a hollow center, perfect for making a nest or to fill with another filling. You can substitute ramen noodles for Chow Mein noodles for traditional flavor. Jumbo Silicone MuffinPan and Sultan Tubes can be purchased online.